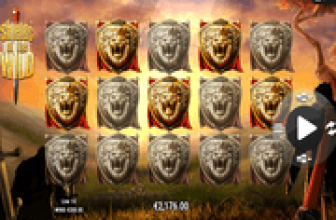 Serengeti Diamonds Online Slot: Win from Bonus Game with up to 10x Multiplier! Serengeti Diamonds online slot is a Lightning Box 25-payline, real-money betting game, delivered to online casinos via the NextGen Gaming software. Themed after Serengeti, a South African Geographical region regarded as the Seventh National Wonders of Africa. Actually, Serengeti is more famous for having the most diverse natural environment to which large numbers of various African animals and bird species migrate. In keeping with the theme, an assortment of African Wildlife and objects native to Africa appear as reel elements that form payline combinations. A Wild Symbol appears in any reel, and poses as wild card that can substitute for any regular paying symbol. Yet the Diamond of this slot game is the most significant as it symbolizes the key to the highly rewarding bonus game. The Wild Symbol is a straightforward WILD emblem set against a depiction of Serengeti's vast savannah. It comes into view in any row or reel, as well as take position in any payline. Identical images of African animals and native objects lining up in the same payline as a Wild, can easily be completed as winning combination via wild-substitution actions. In the event that 2, 3, 4, or 5 Wild icons line up as same symbol combinations in a payline, coin credits of 10, 200, 1000, or 5000 will be awarded. However, only the longest of combination per payline will be paid accordingly. In addition to the winning Wild combo, the outcome has numerous Wilds capable of completing identical symbols. Multiple Wilds in view therefore could lead to multiple coinciding wins with just one spin! Five (5) Serengeti Diamonds appearing altogether after a paid or bonus spin, activates the Free Games. This may seem like a tall order, as such an occurrence may take a lot of betting money before it can be achieved. The Diamond icon though, has a “Hold n Spin Feature” that enables players to land on 5 Diamond Symbols in an easier and more economical way. “The Hold and Spin Feature” occurs whenever two, three, or four Diamonds appear in consecutive reels, starting from the leftmost column. Once this feature is triggered, reels with Diamond images will lock in place, and only the non-Diamond Reel/s launch a respin. The feature awards 3 chances of landing and collecting additional Diamond symbols in order to complete the 5-symbol Bonus Game Combination. If any of those respin chances produce a Diamond, the feature continues until all five (5) triggers the Bonus Game. However if all 3 respins did not follow through with more Diamonds, the feature ends. Still, triggering this feature brings guaranteed wins as the Diamond Symbol awards Scatter Wins. Two, three, four, or five Diamond Bonus symbols scattered in consecutive reel positions, award coin credits equivalent to 2x, 5x, 10x. or 50x the Total Bet staked on the winning spin. Upon activation of the free round, a game panel presents Diamond totems with mystery free-spins and multiplier rewards. Every Serengeti Diamonds bonus game player will be awarded with two picks, to determine the number of free-spins and bonus win multiplier constituting the bonus round. Up to 10 free-spins and up to 8x Multiplier may be revealed. 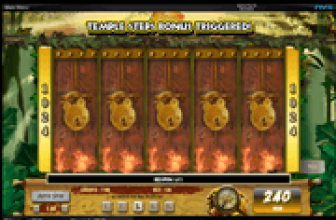 This Serengeti Diamonds slot though is generous enough to give players another chance of vying for higher rewards. Player will be offered an Extra Pick in exchange for a chance to swap, either the Free-Spins number or the Win-Multiplier. Serengeti Diamonds online slot by Lightning Box/NextGen Gaming is out to reward players with amazing wins via a bonus round of up to 10 free games with max 8x win-multiplier. The Hold and Pick feature provides players with a faster and easier way of activating the bonus round, while the round itself gives players another chance to vie for more bet-free spins or higher multiplier factor.